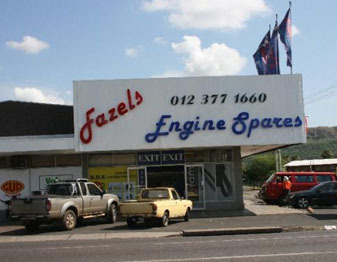 Fazel's Engine Spares was founded in October 1994 and has been trading since then. The Owner Mr. Fazel Aziz has 18 years of experience in the motortrade. We at Fazel's Engine Spares pride ourselves in giving the right part at the right price and have no problem finding the parts that are hard to come by. 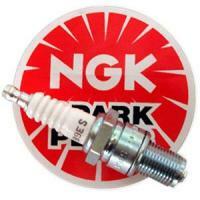 We supply engine parts for all makes and model cars aswell as on trucks, forklifts and tractors. 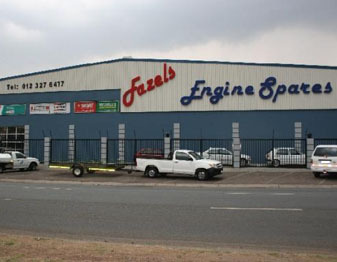 Fazels wide range of engine parts makes it easy to supply parts that suit your budget. Fazel's Engine Spares competes well against all other retailers in the industry and can guarantee a satisfying experience. Our sales team consists of experienced staff that have the knowledge to supply you with the right part first time around. Deliveries are made in and around Pretoria throughout the day except on Sundays. Fazels has gone from strength to strength when we opened our new shop in Mitchell Street, Pretoria West last year July covering almost 2500sqm. With a wider range and more car accessories raging from car care products to car sound and accessories. We offer a safe and secure shopping environment and an experience of something new when you visit our mega store in Mitchell Street. We have also expanded our wings by opening a new store in Hermanstad in June of this year. We are exited and eager for more great things to come.